Kevin Rosen, a lead technical specialist for Irvine, California-based Roland DGA, was named "World Champion" in the 3D/Dental Devices category at the recent Roland DG Global SE Awards competition. Roland DG Corporation, a world-leading manufacturer of wide-format inkjet printers, 3D milling machines, and other digital imaging technology, has announced the winners of its Global SE Awards 2018 competition. The event, which took place April 23-25 at Roland DG headquarters in Hamamatsu, Japan, tested the product knowledge and technical skills of top Service Engineers – 28 finalists from around the world that won regional contests within their respective territories. This year’s competition pitted finalists against each other in two categories: Inkjet Printers, and the new 3D Devices category which included dental milling machines. The winner in the Inkjet Printer category was Mark Johnson from New Zealand representing Aarque Group Ltd., while Kevin Rosen, a Roland DGA lead technical support specialist from the United States, was named champion in the 3D/Dental Devices category. This year was Roland DG’s third Global SE Awards competition to date, with similar contests held in 2013 and 2015. In addition to recognizing the abilities of Service Engineers both regionally and globally, the competition helps motivate the SEs to further improve their skills and raise the standards of Roland DG Care – the company’s comprehensive customer service and support program. The first day of the competition consisted of a written exam that tested the finalists’ knowledge related to hardware, parts, software, and other aspects of product repair and maintenance. A hands-on exam, held on the second day, challenged the ability of each competitor to successfully resolve specific product issues – some of which they may have never encountered previously – within a limited time period. In addition to being tested on their technical skills, the SEs were assessed on how actively they shared their personal experiences and know-how with other SEs, as well as how frequently they used Roland’s online learning platform. 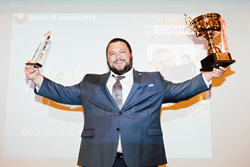 The Global SE Awards represent Roland DG’s commitment to industry-leading customer service, which includes providing SEs with opportunities to enhance their skills, as well as increasing the effectiveness of the company’s online knowledgebase. To learn more about the Roland DG Global SE Awards competition, visit https://www.rolanddg.com/en/support/roland-dg-care/se-awards-2018. For more information on Roland’s complete product lineup, visit http://www.rolanddga.com. Roland DG and its subsidiaries offer a certification program for its Service Engineers (SEs) in order to provide uniform, high-quality service to customers worldwide. SEs are instructed in how Roland DG products are built and receive in-depth training on how to carry out product installation, make repairs, conduct inspections and perform maintenance. Only after passing the certification program, which proves that they possess the appropriate knowledge and skills, can trainees be approved as certified SEs. The certification program, which focuses on the quality of the SE’s daily activities and their professionalism, features a point-based evaluation scale to ensure objective certifications. Roland DG Corporation is a leading manufacturer of digital devices designed to help professionals as well as craft makers and hobbyists transform their imagination into reality. Products include the TrueVIS, SOLJET, VersaCAMM, VersaUV and Texart series large-format inkjet printers and the CAMM-1 and STIKA vinyl cutters for the sign, vehicle graphics, personalization, apparel and textile decoration industries. In 2017, Roland DG formed DGSHAPE Corporation to develop and market the company’s 3D products, including DWX mills and DWP 3D printer for the dental industry, MPX photo impact printers for the medical device, industrial labeling and personalization industries and MDX and monoFab series of desktop 3D printers and milling machines for rapid prototyping, manufacturing and hobby industries. The company uses its proprietary cell production technology to manufacture products that are distributed in over 200 countries and regions worldwide. For more information, please visit http://www.rolanddg.com. Roland DGA Corporation serves North and South America as the marketing, sales and distribution arm for Roland DG Corporation. Founded in 1981 and listed on the Tokyo Stock Exchange, Roland DG of Hamamatsu, Japan is a worldwide leader in wide-format inkjet printers for the sign, apparel, textile, personalization and vehicle graphics markets; engravers for awards, giftware and ADA signage; photo impact printers for direct part marking; and 3D printers and CNC milling machines for the dental CAD/CAM, rapid prototyping, part manufacturing and medical industries. For more information, visit http://www.rolanddga.com.